The Matthews 200mm Adapter Plate converts the 861862 100m VESA monitor mount to 200mm, allowing it to be used with larger LCD and Plasma displays. It weighs 1.5 pounds and is made of steel. Box Dimensions (LxWxH) 8.75 x 8.75 x 0.5"
200mm Adapter Plate for Monitor Mount is rated 3.9 out of 5 by 8. Rated 5 out of 5 by lgcamman from Does the Trick Needed this to mount a 32 in LG on a C-Stand in the background of a set. Very simple and solid product. The LG TV had a weird mounting pattern on the back of the set, it was set in a rectangle instead of the standard square. Only used two screws to mount it, thank god it was a rental as it really needs all four. In summary, good product. You will need to purchase screws to mount to a television as this product doesn't come with any. Rated 5 out of 5 by TV Hanger from Nice Plate Adapter between a LCD TV at 200mm x 200mm and a display stand with a 100mm x 100mm plate.As said before, the 200mm x 200mm holes will fit up to a M6 pass-through hole. My TV needed M8 bolts so you will need to drill the adapter plate holes larger. The plate came with screws for the 100mm x 100mm connection.Nice and solid one-piece construction. Rated 4 out of 5 by Doug from A Lifesaver Adapter I recently acquired a gently used 32 LED HD TV screen for free of charge. It sat in my closet unused for a few months and my wife suggested getting rid of it, but then I realized I could be using it on shoots with some friends (dslr camera-ops) who do not own a monitor. The only hurdle was figuring how to mount it to a C-stand. I stumbled across the MSE Monitor Mount. I also had to buy the MSE 200mm VESA adapter plate for my particular monitor. The only thing I had to do was re-drill the four outer mount holes on the VESA 200 mm plate to accommodate the larger bolts that once secured a Peerless wall mount. Better that the plate came with too small of holes than too large. Other than that, easy and solid installation. The Matthews adapter and VESA plate are heavy duty. Solid as a rock. Overkill. I'll never have to worry about my 12 pound monitor ever falling off of this. I'm a longtime devoted fan of Matthews products. Worth every penny. I couldn't have completed this mod without this particular adapter plate. Rated 1 out of 5 by James from no good for M8 screw 200mm VESA mount After shipping to UK, I realise the screw holes in corners are for M6 sized screws. My 40 Samsung 200mm VESA mount require M8 sized wholes. So need to buy new screws, and drill the wholes bigger. Not happy. 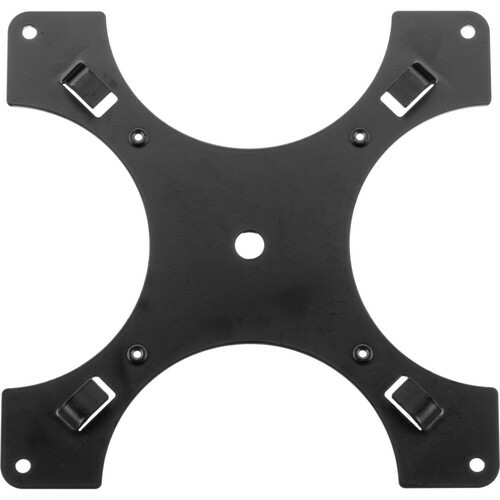 Rated 4 out of 5 by kbot from Great for my 32 monitor This plate fits my 32 samsung monitor well. However, the attachment screws that came with it were too long. I was able to buy correct screws at the hardware store. Rated 5 out of 5 by mcsandberg from Extremely solid! Although not mentioned, this is made of 1/8 or so thick steel, so its really stiff. I used it to adapt to a monitor with 200 MM Vesa M6 screws. It worked perfectly! Rated 2 out of 5 by Brian from Had to Drill new holes I used this to mount a standard 40 inch Samsung monitor but I had to use my drill press to drill new holes for the screws. Disappointed. Rated 5 out of 5 by Duke from Solid Sold nothing flimsy about this will do the job.